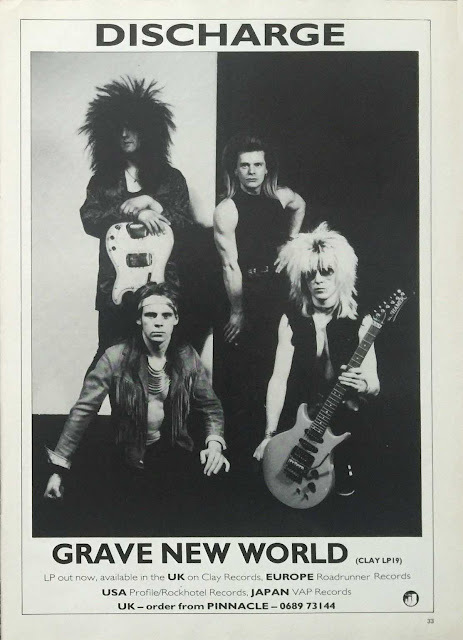 Our final look at Grave New World era Discharge concerns the one that got away, the first track recorded for the LP which for whatever reason didn't make the grade, Taste The Burning. Certainly one of the most tantalising pieces of information from Fish's interview in Our Future issue II, the idea that there is a complete, studio quality outtake from the LP session out there somewhere in the ether is as frustrating as it is exciting. Assuming Taste The Burning was never copied from the original reel to reel the likelihood of this track ever seeing the light of day are slim indeed, however thanks to the power of the DIY underground there are a couple of live versions of the track out there for us to enjoy. The song adds a welcome change of tempo to the 1986 set, but it is this same tempo which perhaps reveals why it was dropped from the final album track listing, being at odds with the LP's more mid-paced assault. Perhaps we will one day see some comprehensive Discharge re-issues - until then we'll just need to keep digging through the underground.